This is getting ugly. Yesterday, a Tallahassee Democrat report indicated that the sexual battery case involving Jameis Winston became "inactive" because the complainant told cops she didn't want to pursue the case. But today, in a statement released by its attorney to Tampa Bay Times reporter Matt Baker, the woman's family fired back, alleging that a Tallahassee detective warned the woman the city is "a big football town" and that "she would be raked over the coals" and her "life will be made miserable" if she were to press charges. Detective Angulo stated that such activity would alert Winston and the matter could go public. The incident occurred last December but had remained unknown to the public until the Tallahassee PD released a heavily redacted police report last week and turned the case over to the state attorney's office, the law enforcement body that, in Florida, must determine whether any charges will be filed. By January, the accuser had told family members that Winston was the perpetrator. It was then that "the family grew concerned that she would be targeted on campus." When the attorney contacted Detective Angulo immediately after Winston was identified, Detective Angulo told the attorney that Tallahassee was a big football town and the victim needs to think long and hard before proceeding against him because she will be raked over the coals and her life will be made miserable. If the victim had been aware that Winston's attorney was alerted as far back as February, she would have insisted that Tallahassee Police Department immediately collect DNA and interview, at the very least, Winston's roommate who witnessed the attack. The family also says they kept trying to obtain the accuser's blood-test results from Angulo and from Fawnisha Brown, the Tallahassee PD's victim's advocate. The victim was devastated when she learned late last week that the Tallahassee Police Department had informed Winston's attorney as far back as February, which allowed him all of this time to create his defense and prepare his witnesses. The victim cannot fathom that the state attorney's office was not given the same opportunity. The family was shocked to hear that Winston's attorney was not only aware of the case but had been told by Tallahassee Police Department that the case had been closed in February. All the while, the family was awaiting blood work results until early April. The family goes on to say that they had no role in the incident becoming public, and neither did the accuser. They ask why Angulo did not "conduct a proper investigation." They ask why it took four months to get the blood test results. They ask why it's been reported that the accuser was intoxicated when they say Angulo informed them the blood test revealed she wasn't. They ask why Winston was not ID'd as a suspect on the police report until January. They ask why it took 11 months for the case to go to the state attorney's office, and only then after the media—led by Baker, The Times reporter—began poking around. 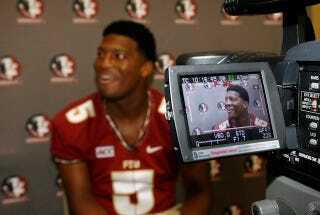 And they ask why FSU police was given a copy of the police report even though they have no jurisdiction and "Winston's attorney represents the Florida State University football team." The family's complete statement can be read here.